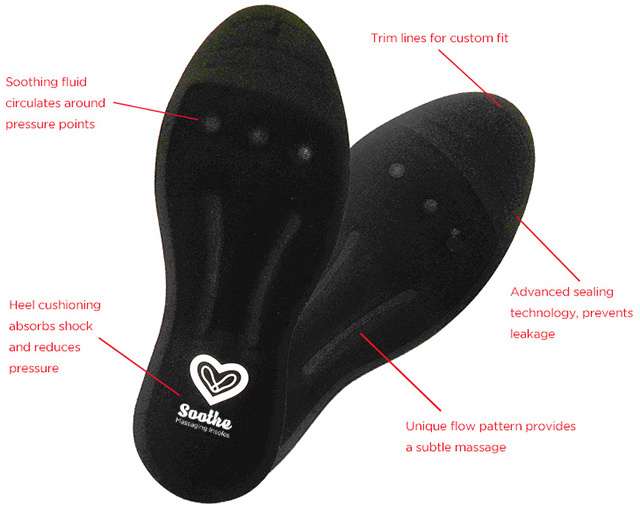 Soothe Insoles therapeutic insoles are known to significantly increase the circulation to the feet and lower legs. These ulta-thin, comfortable insoles are filled with a pure, pharmaceutical grade glycerine, rather than foam or gel, so will not flatten or wear out. Instead, the fluid is pushed up under the arch of the foot, providing gentle but firm support for flat feet and dropped arches and significantly reducing pain. ARE SOOTHE INSOLES INSOLES GUARANTEED? Please register your details on the Contact page of our website within 30 days of purchase and note our Customer Care Guarantee. Soothe Insoles insoles are guaranteed for a full year against manufacturing defects. In the unlikely event that you experience a problem with your insoles during the guarantee period please return them to us straight away, together with the original packaging and receipt. We will send a replacement pair of the same size by return. We also offer an unconditional 30 day guarantee, from the date of purchase. Within 30 days of purchase you may send the insoles back to us for a full refund of the purchase price paid, excluding any postage and packaging costs. Please retain your original packaging as proof of purchase date. We endeavour to process all orders within 24 hours of receipt. UK orders will be delivered by first class post. CAN I PAY SAFELY BY CARD? Your details are safe and secure. We do not retain your card details at any time. When you enter your card details you will be directed to the PayPal server which is an extremely safe, secure payment processing system and is covered by their security guarantee. We hold only your name and address in order to send you the goods you ordered and provide you with the best customer service. If you opt to join our mailing list, then your name and e-mail address will be held on our database. We NEVER pass details to any third party company and we fully comply with the Data Protection Act. You may at any time unsubscribe from our mailing list by emailing sales@sootheinsoles.co.uk and stating the e-mail address you wish to have removed. We comply with all relevant legislation, including the Distance Selling Regulations, and we strive to offer you the best online shopping and customer service experience. Please refer to our Customer Care Guarantee. To maximise the benefits from your Soothe Insoles insoles and ensure that we supply the size which best fits your feet, we suggest that you measure the length and width of your feet in centimetres and order accordingly. If in doubt it may be preferable to select a size bigger and trim to fit your own foot size using the contour markings at the toe edge as a trimming guide. Important: Please do not cut into the side edges of the insoles. IS THERE A CUSTOMER LOYALTY SCHEME? If you have bought Soothe Insoles before and wish to buy more, please contact us for a promotion code. Enter the promotion code in the discount box on our shopping cart and you will be entitled to buy 2 pairs of any size for the price of 1 (at MRP). Please contact us if we do not have the answer to your question here: 0161 860 0408 or email: sales@sootheinsoles.co.uk.